The best wood for a picnic table hinges on cost, durability, function and appearance. Fir is the most affordable, composite or treated wood is the most durable, and cedar is one of the most functional. But nothing beats redwood for beauty. Fir is the best lumber for affordable picnic tables. It's readily available at any home supply store or lumberyard, and the variety of plank sizes is incomparable. It's moderately resistant to decay and has adequate weather resistance when properly sealed and maintained. Fir has tight grain with few knots. When properly stained, fir resembles redwood. The thickness and length of fir is consistent and reliable. The large quantity, affordability and availability of fir lumber allows for hand selecting and rejecting pieces you don't want. If you find some of the pieces have defects, such as warps, cracks or knots, the pieces can easily be replaced. Treated wood is the contemporary answer to outdoor picnic tables. Treated wood is weather resistant via the injection or immersion of the wood in chemicals. The process leaves the surface of the wood slightly rough, but when sanded and sealed, it provides a clean, smooth surface that's ideal for high-moisture environments. Treated yellow pine or Douglas fir picnic tables cost more than untreated wood of similar species, but the advantages of fewer maintenance requirements and greater durability make it a viable option to other wood species. Another option comes in the form of composite wood made with wood byproducts, resins, heat and pressure. Picnic tables built with composite lumber are reliably straight, strong and durable. Composite lumber usually has a slight imprint of grain on four sides. Typical colors are tan, green or brown, but it can be stained if desired. Composite picnic tables require little to no maintenance. Cedar may be the most functional. It's weather and insect resistant, contains natural preservative oils that protect it from decay and rot, and it emits that familiar, pleasant scent. Cedar is dimensionally stable and resists warping, twisting, cracking, splitting and checking, which is a series of small cracks on the surface of the wood. Although cedar is classified as a softwood, it's comparable in strength to some hardwoods and more affordable than most. You can add sealer or stain to cedar for increased protection but if left unfinished, cedar weathers to a gray color many people find attractive. Purchase rough cedar for a rugged look and sanded cedar for a finished appearance. Redwood could be considered the queen of exterior table building material. The natural reddish color is easy on the eyes. Redwood has one of the highest ratings for natural durability and it resists insects, weather and decay. The straight, tight grain lends strength to redwood. Redwood is prized for dimensional stability. It shrinks and swells less than other wood commonly used for picnic tables. Redwood is lightweight, strong and easy to cut, nail or screw. The warmth, beauty and appeal of redwood put it at the top of the list for high-end tables. 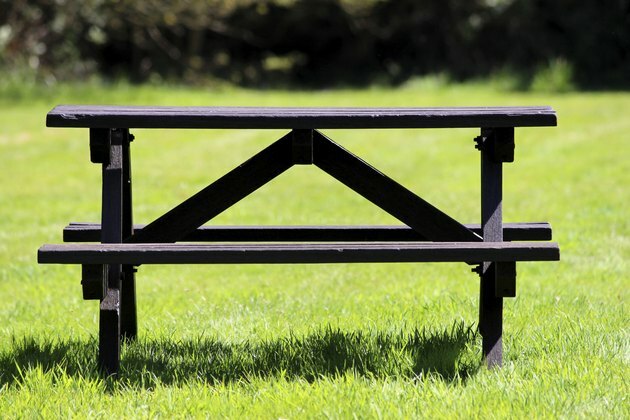 It may cost more than other picnic-table wood species, but redwood stands out from the ordinary.